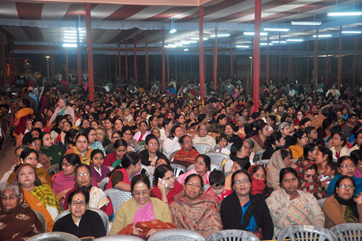 January 31, 2014, Friday, Belur Math (Kolkata). 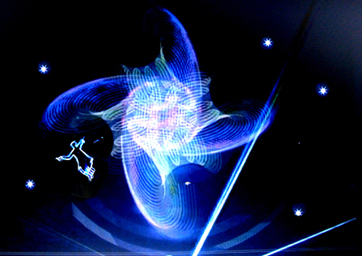 A historic day at Ramakrishna Math, Belur Math, where Swami Vivekananda came alive through the laser documentary built on his life story. 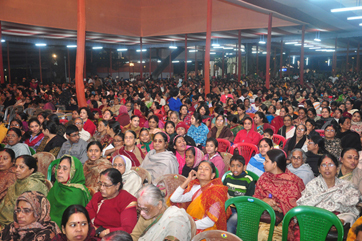 An approximate 15,000 people witnessed the show in a covered, massive Pandal-theatre built by the bank of river Ganges at the Belur Math. 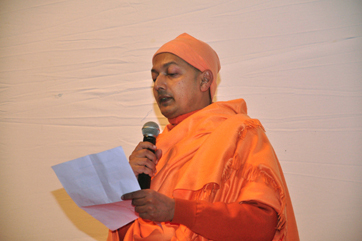 “It is indeed a Grand Finale for the closing ceremony of the 150th Birth Anniversary of Swami Vivekanada at Belur Math, a perfect ending”, said an ecstatic Swami Suvirananda, Asst. 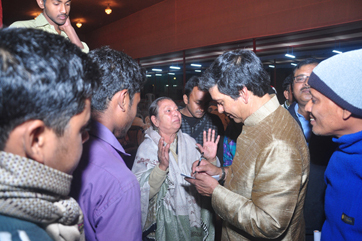 General Secretary of RKM, Belur Math, after the show. 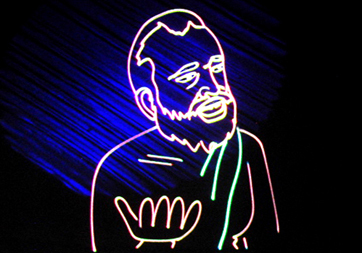 The show ran for a continuous one-hour, the longest laser documentary ever built on a human being, which also proved it to be the greatest. 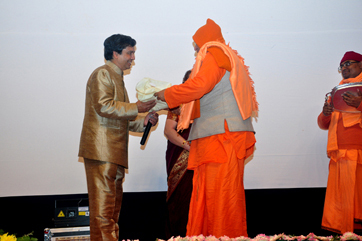 “We are honoured to have this unique show of universal acclaim at the Belur Math, and thank Manick Sorcar and his wife Shikha Devi for making it happen”, said Swami Girishananda, the General Manager of the RKM, Belur Math, as the Sorcars were felicitated on stage. 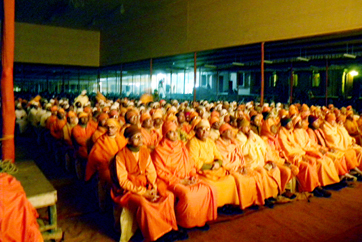 (Left) The sitting arrangement followed the Ramakrishna Math, Belur Math tradition. The senior monks up front, followed by other monks. 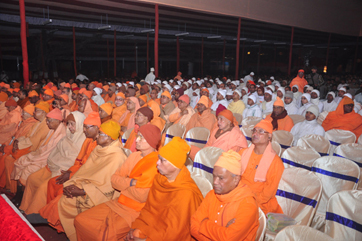 (Right) Brahmacharis with white wears sat just behind the monks. 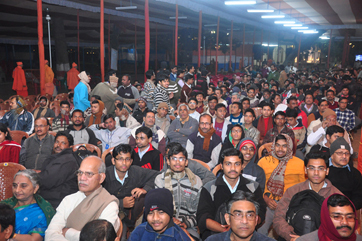 (Left) General devotees and admirers - men’s Section. 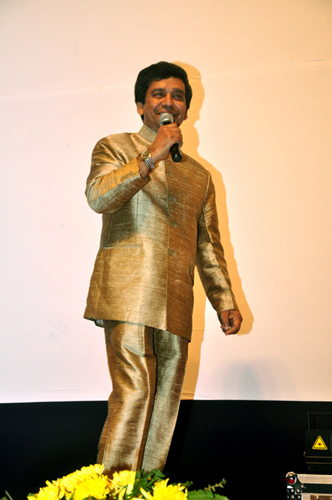 (Right) Biswaroop Maharaj introduces Manick Sorcar on stage. 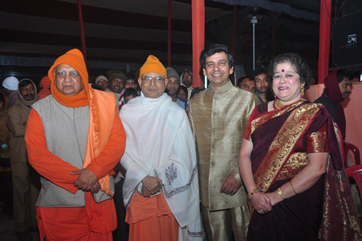 (Left) The Sorcars are felicitated by the RKM, Belur Math after the show. 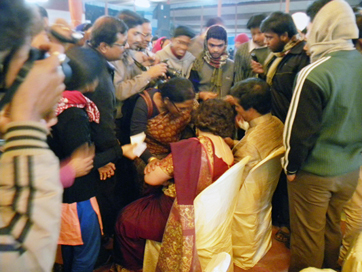 (Right) At the invitation of the audience Manick and Shikha came down to be with them after the show. 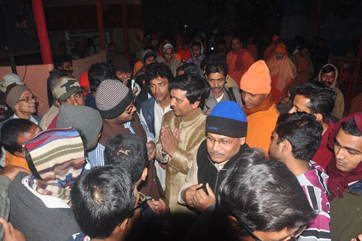 (Left) “Bless you son”, said an emotional elderly lady, “it is exactly like we know of Swami Vivekananda, and you brought him to life” (Right) Amongst the admirers.